Simple design – conveniently made to be concealed in cars or buildings. They are usually very small devices with microphone, GSM transceiver and battery (if not powered by the housing). All that is needed is a SIM card. Turn it on and a number is assigned to the bug and the network enabled. It’s activated by calling the assigned phone number. Range – many can hear up to 30-50 ft. (10-15 m). Because they are GSM they also have tracking capability. Inexpensive and easy to acquire -easily purchased on the internet with a large variety of disguises for less than U.S. $40. 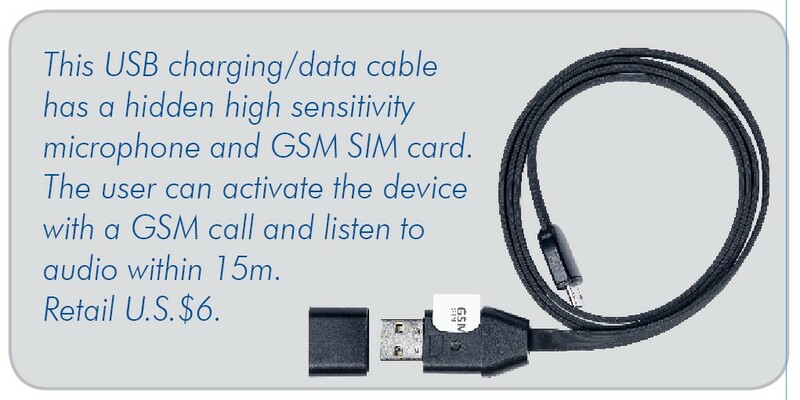 Most GSM bugs have settings that can be easily changed remotely by sending a simple text message: voice activation, microphone sensitivity level, anti-detection function, and more. They can often be set to call or text the eavesdropper when voice or motion is detected, or store recordings directly to a memory card for future download. As a manufacturer of counter-surveillance equipment, it is a tricky exercise to educate users without going into too much detail how illicit surveillance products work. It’s important to know, however, the types of threats that may be encountered in order to defend and protect information. Unless you accidentally stumble across a GSM bug, it will take special skills and equipment to detect and locate one. The REI Training Center offers regularly scheduled countersurveillance courses including certification in RF and telephony.